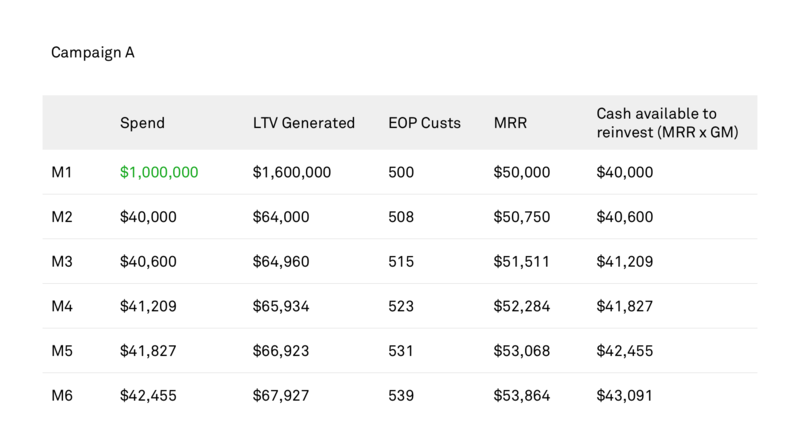 Most SaaS marketers and analysts measure the success of their campaigns with lifetime value (LTV), cost of acquiring a customer (CAC), and the margin between the two. It’s the correct first step to take when analyzing any campaign. After all, LTV margin is the fundamental metric that demonstrates whether a campaign is sustainable. However, when choosing how to allocate limited capital between two LTV-profitable campaigns, most fail to do any analysis beyond this first step. They simply optimize towards the campaign with the highest margin. Unfortunately, focusing solely on LTV margin can come at a significant cost to customer growth, revenue and profitability. The key to determining the best campaign, and what most marketers fail to consider, is the rate at which a campaign returns capital, also known as the payback period. The inspiration for this post came from my experience hiring online marketers and analysts. I use a simplified version of the examples below as an interview screener. The vast majority of candidates flunk it – with more than 90% (including experienced SaaS marketers and analysts) never initiating a discussion around payback periods. Using two examples below, I show the price many pay by optimizing simply to LTV margins and the upside possible by understanding payback periods. Imagine you’re the head of online marketing at a SaaS company and you are given $1 million to acquire customers. You’re optimizing for growth. You have data on just two successful campaigns, and you can only invest your $1 million in a single campaign. 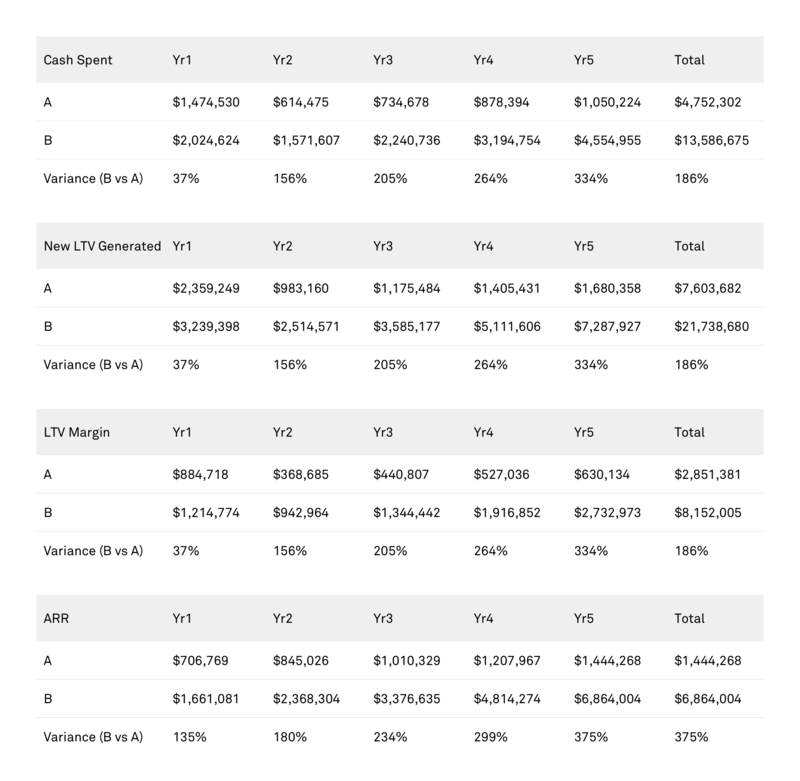 Understand your unit economics (LTV, CAC, Margin). Consider how that payback period impacts your ability to reinvest in the business. Now let’s go through our first example. You spent $1 million to get $1.6 million in LTV, therefore you made $600,000 profit. How does that compare to campaign B? You spent $1 million to get $1.509 million in LTV, therefore you made $509,000 profit. By this math, campaign A is the more profitable of the two options. Most analysis simply stops here and campaign A is the choice. However, stopping there is a critical error. We must also evaluate the payback period. If you spend $1 million to acquire 500 customers, you’ve paid $2,000/customer. You get $80/month ($100 ARPU x 80% GM) per customer, so you break even in approximately 25 months. If you spend $1 million to acquire 367 customers, you’ve paid $2,727/customer. You get $144/month ($180 ARPU x 80% GM) per customer, so you break even in approximately 19 months. The payback difference between campaign A and B is only 6 months. That doesn’t sound too bad, right? Anyway, campaign A generates more LTV and more customers, and has lower churn and higher profitability. Let’s go with option A! As you may have guessed, it comes back to how quickly you’re seeing return on your investment. In campaign B, you’re getting paid back faster. If you take that cash and reinvest it into customer acquisition, you can actually accelerate growth. You’ll see that option B very quickly overtakes option A. Our original LTV math told us to pick campaign A – now you understand why I use this to screen interviewees. By taking the extra step of factoring in payback period, we get a dramatically different outcome, with significant ramifications for the business. I’d like to drive this point home with one more example (with all the math already done). We’ll use the same concept; imagine you’re a marketer given $1 million to acquire customers and build a business. Except in this example, campaign B is slightly different, with a .20% CVR, $150 ARPA and 5.0% monthly churn. Following our framework, we calculate and get the following unit economics. 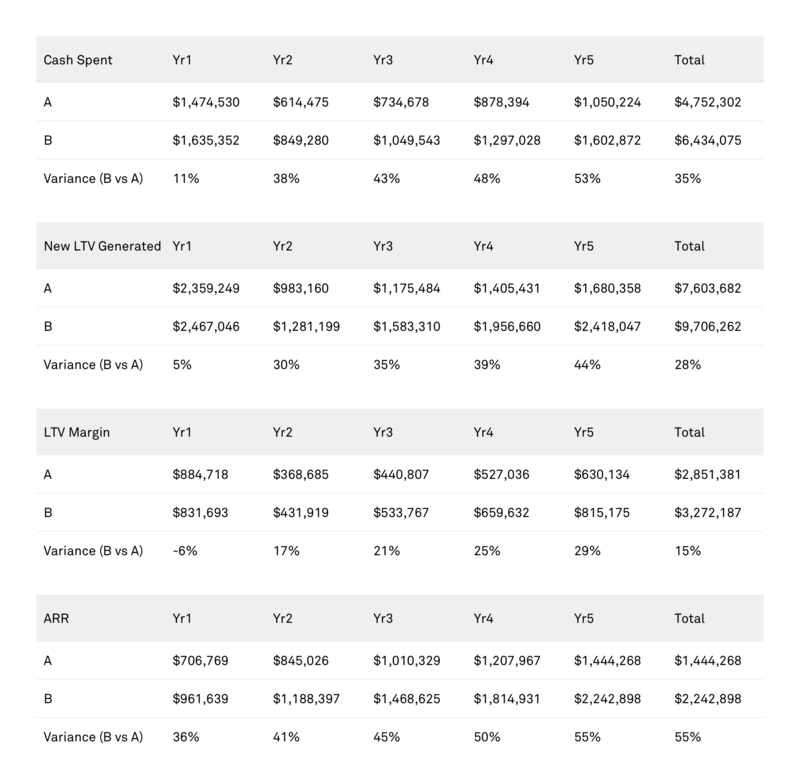 This time, you can see that both options generate the same amount of LTV and LTV margin. Perhaps you should be indifferent, but now you know better. Let’s look at payback rates! Campaign A pays back in 25 months ($1 million in spend / 500 customers = $2k CAC … $2K CAC / $80/month = 25 months). Campaign B pays back in 13 months ($1 million in spend / 666 customers = $1.5k CAC … $1.5K CAC / $120/month = 13 months). All right, so B pays back in roughly half the time: 13 months vs. 25 months. Now let’s reinvest our cash back into customer acquisition and see how the two campaigns fare. Nope, you’re not reading this wrong. That’s the beauty of compounding growth: after 5 years with campaign B, you’ll have nearly a 5x larger business than if you’d implemented campaign A. The unit economics told you they were the same (or even gave the edge slightly to A), but the payback rates tell you they’re dramatically different. Campaign B is the clearly the better option if you want to grow your business. When measuring your online advertising campaigns, it’s not enough to simply look at LTV and cost unit economics. This can lead to critical oversights and missed opportunities. The velocity at which you’re able to get cash back from your customers and reinvest it into the business dictates how quickly you’re able to grow. Keep that in mind as you make tradeoffs on where to invest your hard-earned cash. One of the easiest ways for companies to drastically change their payback periods is to have customers pay annually and upfront. Now that you understand the power of payback periods, imagine what collecting cash upfront could do to your growth!